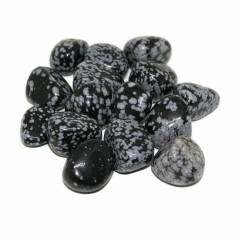 An interesting semi precious form of Obsidian, included with small crystals which give it a speckled appearance which almost seems like snowflakes. 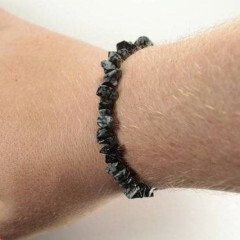 Obsidian is a naturally occurring volcanic glass, consisting mainly of Silicon Dioxide – Iron and Magnesium sometimes give the Obsidian a dark appearance. As a glass, Obsidian shatters into incredibly sharp pieces – it has been used throughout time for blades or arrowheads, and was considered in modern days for use as scalpel blades, as it produces a far finer cutting edge than steel. 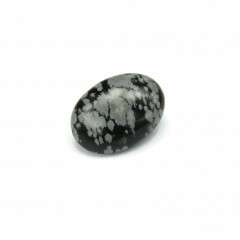 Inclusions of small clusters of Cristobalite crystals create a special kind of Obsidian, with an interesting snowflake style pattern – simply, Snowflake Obsidian. 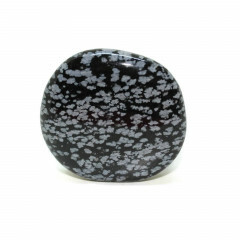 It is considered a stone of purity, which helps to balance mind, body, and soul. It is perfect for the root or the sacral Chakras. 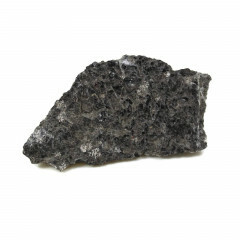 As a purifying stone, it is considered to be a calming influence – helping you rid yourself of negative thoughts or emotions such as anger or jealousy, and helping with meditation. 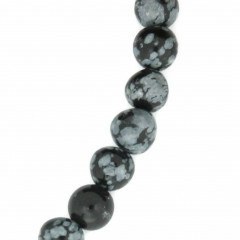 It is therefore aligned with the Root chakra and is ideal for those born under the sign of Sagittarius.